​What is an Apprentice Trainer? At Good Dog! Autism Companions, we like to invest in our trainers! 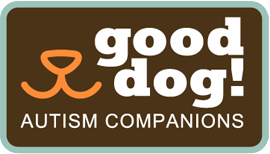 We provide dog trainers, who have little to no autism service dog training experience, with the tools, skills and knowledge necessary to fully train an autism service dog from puppy to a graduate! After the Apprentice Trainer graduates their first autism service dog, they may be selected as a paid trainer! Please ONLY apply if you have some dog training experience.